The whole point is about safety. At least, that is one of many benefits of accelerated bridge construction (ABC) as explained by those who have been heavily involved in the process for dozens of ABC projects over the last decade. According to the Federal Highway Administration’s (FHWA) final manual on ABC, the intention of utilizing ABC methods is to improve site constructability, total project delivery time, material quality and product durability, and work-zone safety for the traveling public and contractor personnel. Since the mid-2000s, ABC methods have been successfully implemented on thousands of bridge projects in the U.S. However, due to the collapse of a newly installed pedestrian bridge built with ABC methods on March 15 at Florida International University (FIU), just over a week ago as of this writing, questions have been raised regarding the construction methods done on the bridge. While authorities, including the National Transportation Safety Board (NTSB), are still investigating the details of the accident at FIU, experienced professionals within the ABC realm are weighing in on their perspective of the incident as it relates to accelerated construction methods. According to the FHWA, there were approximately 669 fatalities from crashes in work zones in 2014. While workers and DOT officials do their best to make work zones safe, accidents in work zones pose a threat to both the safety of the traveling public as well as to the construction crews out on the job. One of the construction methods for ABC involves constructing the bridge off-site and away from traffic, then transporting it with a self-propelled modular transporter (SPMT) to its permanent supports. This was the method implemented for the FIU pedestrian bridge, which according to FIU News was the largest pedestrian bridge moved via SPMT in U.S. history. “I’ve been involved in several accelerated bridge projects where we used SPMTs to move new bridges into place,” Mike Arens, office executive for Michael Baker International, who has worked on many ABC ventures as project manager, told Roads & Bridges. “We apply the same quality control that we use on the traditional portion of the design to the accelerated bridge construction part.” Arens explained that quality control procedures include an independent review by another engineer to ensure all the proper checks and calculations were made in the design process. The inspection process on ABC structures generally begins with the design team that includes engineers who are experienced in ABC methods. For many states, that design goes through an approval process with the state’s department of transportation using the FHWA design manual that includes all checklists needed to make sure the bridge meets safety qualifications which have been developed over the years. During preliminary stages, designers have to take into account any additional loads or stresses that the ABC process may induce into the structure. “In terms of the inspection and monitoring that takes place out in the field, we monitor for flexure or rotation in the structure, as well as elevation changes throughout the move of the structure,” Arens said. “One of the benefits of self-propelled modular transporters is all of those axles on the trailer are all independently able to move. And so the transporters actually maintain a level platform as the wheels go over bumps or grade changes. And so that feature and that process really minimizes any additional stresses that could be caused during the bridge movement.” Arens explained that before the bridge is ready to be put into service, crews do a final inspection and walkthrough of the structure looking for any irregularities or damage that may have occurred during the bridge move to ensure the bridge design is intact. 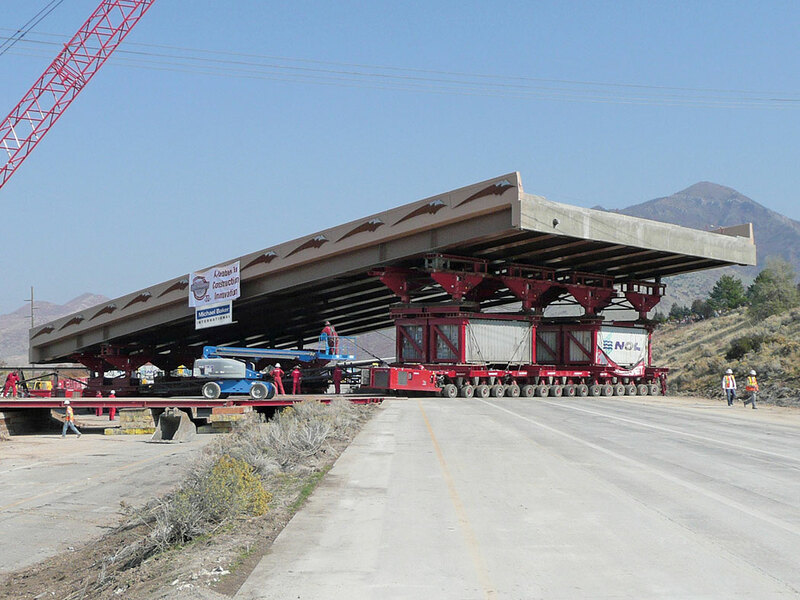 Michael Baker International moved the 4500 South Bridge over I-215 in Salt Lake City using SPMTs back in 2007. The FIU pedestrian bridge was a 174-ft, 950-ton span that collapsed less than a week after installation while crews were working on top of the bridge. Touted as the largest pedestrian bridged moved via SPMT, some may wonder if the bridge’s weight may have played a role in the collapse. But heavy bridges have continually been installed with SPMTs for a long time, as explained by experts. “The biggest one that we’ve done, my company, we lifted a 6 million-lb bridge with SPMTs—we had 165 axles,” Culmo said. “You could lift some really big stuff with these things.” That bridge is more than double the weight of the 2 million-lb FIU pedestrian bridge. The Sam White Bridge, constructed back in 2011 in Utah with the help of designers at Michael Baker, is another larger bridge that was designed and constructed with ABC methods. At the time, the 354-ft, 3.8 million-lb structure was touted as the longest two-span bridge ever moved by SPMTs in the Western Hemisphere. Still, the designers and fabricators interviewed here contend that weight does play a role in the ABC process. “When we do prefabricated elements, we try to keep the weight of the elements within a reasonable size for shipping,” Culmo said. Another concern that has come up as a result of the FIU bridge incident was the issue of cracking in the structure. Early reports after the collapse explained that a bridge engineer indicated in a voicemail to a Florida DOT employee that cracking was observed on the north end of the span. While there are still questions left unanswered from the collapse at FIU that tragically took the lives of six individuals and left several others injured, those connected to the ABC industry hope that this incident will not lead to a diminishment in the use of accelerated construction methods for bridges. As of this writing, multiple news outlets are reporting that federal investigators with the NTSB have said that they have confirmed that workers were adjusting a tension rod on a newly installed portion of the bridge when it collapsed. NTSB reportedly said that the adjustments to this tension rod occurred after having done the same work on the south end of the structure. The NTSB was in the process of removing components from the north end of the collapsed bridge for further testing. Bruns is the associate editor of Roads & Bridges.